Question: In the modern era we must put ourselves in line with the wishes of the wide audience, whereas before, students had to become similar in qualities with their teacher. How is this combined? Answer: We reveal the Creator in the center of the group. In our relations, we are the upper, and He is the upper above the upper. And besides that, outside of us, there is a wide audience—the lower, the people or humanity. Accordingly, we (Bnei Baruch – BB) must apply joint efforts together in work between ourselves, as well as to address the outer circles, adapting ourselves according to them. 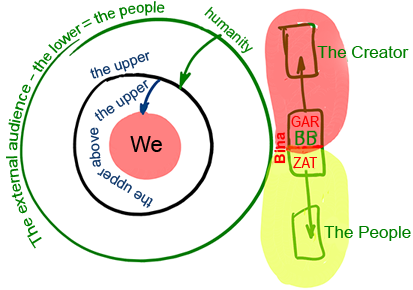 To do this, we split into two parts: the seven lower Sefirot (ZAT) and the three higher (GAR), and we represent Bina and take the appropriate form at the top and at the bottom. Baal HaSulam “The Teaching of Kabbalah and Its Essence”: All the worlds and everything that fills them in their every detail emerged from the Creator in one, unique, and unified thought. And the thought alone cascaded and created all the many worlds, the creations, and their conducts, as explained in “The Tree of Life” and in the Tikkunei Zohar. “Thought” is the force that descends and acts in its derivative. The power of the thought forms the “material” of the desire and then acts in it, imprints itself in various forms. The desire accepts these “imprints” and changes accordingly. Entering the desire, the thought “corrupts,” changes it, until it becomes aware: “There I am, and there is the preceding thought that created and changes me. This means that it is better for me to join it. Let me have my thought through which I control the desire, rule it, instead of it controlling my calculations.” Indeed, while the desire dominates, our life is determined by the requirements of the body, so isn’t it better to entrust the management to the head, the mind? Kabbalists discovered that nearly six thousand years ago, and then during the three periods, two thousand years each, the Lights were entering the vessels, the thought entered the desire. And today, all of humanity, everyone’s common desire discovers and realizes the result of this process, “What is happening to us?” The situation is bad; we suffer, live in a lie, not knowing the reasons, not finding solutions… Why? Thus, the thought inspects the desire and the states, “it is guilty of what is happening. Apparently, it has to be managed differently.” And gradually, we are approaching the point of this solution: Will the thought manage the desire or the desire manages the thought? This is our choice. Answer: True, otherwise we would not be able to know Him. We must know the truth, and this is only possible from lies. Everything is conceived only from its opposite. We need bitter to know sweet and darkness to know light because the darkness is opposite to the light; otherwise, you could not recognize anything. You need a measuring point that is outside of the measured properties, a benchmark against the calculations that are made. We are vessels, desires, and only in this way can we measure, feel, and understand something by comparing the two opposites. The Creator is united, and we are not. We need a comparison; otherwise, we seem to float in a vacuum devoid of any landmarks without a sense of direction. Moreover, if we were put in a special liquid with special conditions, with the same gravity as our body, then we would stop feeling it. The same thing can be done with our consciousness; if it is free from polar orientations, then we lose a sense of our self, our existence, because we are unable to feel the opposites. So, as the created beings, we can measure and evaluate ourselves only by contrast. In Kabbalah, it is said that the advantage of the light is known from darkness. Thus, you will not reach perfection if you have not passed through all the troubles of the world, through its “underworld,” the opposite side of the “Garden of Eden.” But you can know this “kingdom of darkness,” like a wise man, who still in darkness, sees the emerging dawn. However, the question arises: If today I see perfection from afar but I do not feel it in my vessels, then what will happen tomorrow? I do not agree to “look at the paradise through binoculars,” I want to enter its gates. That is why there is a need for the breaking and its subsequent correction. It is enough if we feel the gap between us slightly, and then the rest we will get from the group in the finished form. Question: Why does a person go through such difficult states that show how low and distant one is from spirituality, yet we are still required to be happy? Answer: A person isn’t shown more than he can bear. If he were shown his real state, he would simply burn like in a short circuit. So we are constantly held between certain limits, between two points, so that a person will be able to bear it. It is like a fuse that burns when the current is too strong. As long as the current is normal, it transmits it. Its role is to hold on until a critical situation occurs and then it burns out, but it keeps the system intact. Everything has a certain limit, and so from above, a person is gradually shown the AHP of the upper level, its posterior. If he is suitable for it as a result of his own exertion, then he is ready to ascend to the next level. Opinion (Sergei V. Lukyanenko, science-fiction writer, author of Night Watch and Day Watch): “In the competition between the USSR and the capitalist world, the USSR at the beginning had two trump cards: internationalism and social equality. By discarding belief in God, national patriotism, competition – only by these two ideas ‘internationalism and social equality,’ the Soviet Union waged competition with the world and even was a leader in some moments. “The fact is that ‘internationalism and social equality’ appeal directly to the human desire for justice, equality, brotherhood. – By demonstrating that the capitalism in the ‘West’ is also capable of internationalism and social justice (providing for the unemployed and education for the poor) – this was done in the ‘West’ by introducing a system of free healthcare, social assistance, free and accessible education, equality of nationalities and races. “After that, the Soviet Union was doomed because in the stimulation of production, productivity, flexibility of production and trade the benefits of the capitalist system are obvious. “But the mechanisms that are running ‘in the West’ continue to work: by letting millions of immigrants and giving them citizenship, it is impossible to return to nationalism without shocks. It is also necessary to recognize the freedom of belief and equality of religions. “Creating a system of social assistance to the poor, countries have to put up with millions living on welfare and demanding everything from the state. Having declared the equality of sexual minorities, it is ridiculous not to expect that this will finish Christianity, disintegrate society, destroy the foundations of Euro-American civilization. Question: What is the difference between a union (Brit) and mutual guarantee (Arvut)? Answer: Union is a preliminary connection, prior to mutual guarantee, when we just agree to be in connection with each other. Mutual guarantee is a state when we enter each other’s desires, work together in them: I work on your desires, you on mine, and we provide each other with full mutual support. I become your guarantor, take you under my wing, think not about myself but about how to provide you with all my resources. And you see what I need and will think how to provide me with your resources. This mutual support when we mutually fulfill each other’s desires is called mutual guarantee. But at the beginning, it is characterized by establishing union: an agreement is signed, subject to further realization. In principle, this and that work together. My “I” refers to the part of me that seeks connection with the Creator, and everything else is my animal (physiological) manifestation. In other words, a person’s image consists of two parts, and they should be clearly distinguished. One of them is an animal part, with all the human problems, his weaknesses, his desires, and everything that belongs to him as to a material object. What Is The Center Of The Group? Question: What is the meaning of the center of the group? Is it an internal component a person has, including our impressions from our collective actions and from the workshops? Answer: The center of the group is what we constantly analyze and clarify, exploring it in our attributes, in our view: Where is it, how is it characterized, what should I yearn for? I have to feel what the center of the group is internally. It is very blurry, like looking at a target that is constantly moving and which I cannot focus on through a site. However, if I determine it clearly, it means that I have come in contact with the attribute of love and bestowal. Question: Through which concrete actions do I find the connection with the center of the group? Answer: Such a connection is determined by a person’s need for it in order to connect to the Creator and to bring His revelation to the world. In the article “The Messiah’s Shofar” and in other articles too, it says that Israel, those who yearn straight to the Creator, will not leave the exile and will not attain a connection with the Creator unless they bring the whole world to it. Now, the time has finally come for us to incorporate the external ego of the masses, and we must demand the Creator to fill it. At the same time we can only be the conductors, the point of adhesion between the Creator and the rest of the world; the revelation of the Creator in the world is our mission. Question: How can I determine whether I disseminate from the center of the group or not? Answer: You should feel that yourself. If you disseminate and at the same time constantly fear not leaving the center of the group, then everything is fine. Question: If, for example, the entire central group transcends the Machsom together, what would happen with the daily Kabbalah lesson? Answer: The daily Kabbalah lesson will be held beyond the Machsom. Now, too, I give you energy and the knowledge of everything that happens beyond the Machsom. Talmud Eser Sefirot and the other sources are written on the spiritual level, but at the moment you perceive them on the level of the corporeal world. Beyond the Machsom you will already feel it on a different level. Suppose I examine a painting together with the artist and he says: “You can add a bit of yellow here or red here and here a bit more blue.” He relates to the painting in a strictly technical manner, while I am impressed by the colors of the picture and how it influences me. Usually a painter sketches an outline of a picture by using a pencil before he begins to paint it. And I don’t see that. The Creator also makes a pencil sketch before he paints the whole colorful picture before us. Gradually, you begin to see the inner connections, the inner forces in this general picture. You begin to feel how he adds certain new colors to the painting, something illuminates, and something is removed and creates new contrasts. All this sparkles before you in your senses. You will determine the level of interaction by the Aviut (the depth of the desire) through the Masach (screen), through the forces that depict this world to us. It will be clear to you that everything stems from one force only, from one intention: to make you as perfect as He is, as your source. Question: What did you feel just before you transcended the Machsom? Answer: The same states that one feels before the exodus from Egypt: terrible pressure on all sides, a full yearning forward, fear of the unknown, of what there is before me, and at the same time, the fear of not reaching the spiritual attainment. All this happens not when you yearn forward artificially, but when you really act, yearning for the center of the group and at the same time pushing yourself from behind by disseminating the integral method, just like you spur on a horse by using a whip in order to push ahead, and then you break through.